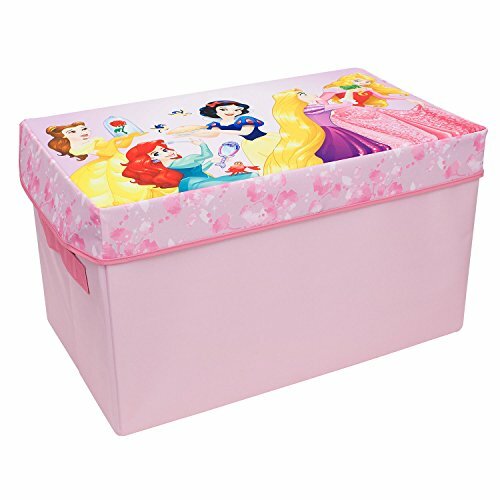 This collapsible toy chest by Everything Mary features Disney's Forever Princesses and is made for ultimate convenience. These fully collapsible toy chests offer tons of kids toy storage and are perfect for closet organization, kids bedroom decor, playroom, kids room, or for traveling with kids toys. Our collapsible & foldable toy chests feature a tightly woven 300 denier high quality polyester. This tightly woven fabric provides extra strength to keep your children's toys secure. These toy chests have two reinforced extra strong side handles, making transporting from the kids bedroom to the boys and girls playroom easy. These toy chests are better than cheaper toy chests on the market, the fabric we use adds extra strength and durability when storing toys under the bed, in the closet, or in any other living space. Everything Mary makes other products by DC Comics, Disney, and Marvel, as we specialize in storage for every room in the home including the bedroom, bathroom, living room, office, and playroom.